How to keep motivation high to keep your Fitness New Year Resolutions! If you have made a New Year Resolution you will know the hardest part is keeping them! Here are my top tips for making sure your resolutions become a way of life. 1. Incorporate more activity into your daily life. Actions speak louder than words and even small changes can make a huge difference. Don't just join a gym! If you really want to change something, you'll have already made steps to do so. Being more active doesn't mean you've already been for a run or hit the gym (although that's a great start). You may have opted to walk instead of take the car, or have got the kids out in the fresh air. Start today with small changes - not next Monday. 2. The weather mustn't stop you. Newsflash: Rain, wind and cold are not unusual weather conditions for January. Yes, it's grey and soggy but you won't melt. Grab your rain jacket and get outside. If muddy puddles are good enough for Peppa Pig, they're good enough for you. Then treat yourself to an indulgent soak in the tub when you get home. 3. Block out workout sessions in your diary. Blocking out time in your diary is the only way to ensure you workout, especially if you're a busy person. If it's your work diary, use work speak: 'meeting' (with your Pilates instructor) or 'training course' (in the park) are much easier to justify than 'gym-time' - especially if your colleagues are not exercise enthusiasts (more on that later). Time won't find itself. Set the alarm for 20 minutes before the kids get up or walk for 30 minutes in your lunch hour. FACT: Increasing your exercise levels increases your body's ability to produce energy. FACT: Exercise is one of the best ways to manage mental health conditions like anxiety and depression. FACT: Fitness and strength gains improve your cognitive function. FACT: Exercise boosts your immune system. FACT: Regular exercise reduces your risk of diseases like Alzheimer's, heart disease, type 2 diabetes and lifestyle related cancers like breast cancer. FACT: Exercise can actually keep you younger by reducing muscle and brain atrophy. Choose one or all of the above and your regular exercise session becomes a vital part of your wellbeing. It's your choice, factor in regular exercise sessions or spend a similar amount of time out of action, curled up on the sofa – sick. 5. Stock your fridge/freezer to be stocked up with nutritious food. Food planning is the key to great nutrition. You can't train or adapt to exercise on a poor diet. Fish, meat, greens, pulses, vegetables and plenty of water should be the norm, rather than the exception to your dietary rules. 6. Have a back up plan. Whether it's a 20-minute 'at home' workout (and we have some great videos that can support this here) or a home cooked meal in the freezer, back up is your health and fitness insurance. 7. Get support or a train with a partner or group. Training goals are much easier to achieve with friends, or as a team. If you know you struggle with motivation, join a class or enter an event as a team. As a Pilates instructor, I know that my most consistently well attended classes are those where participants have become friends and we often end up giggling. They are also the participants who progress quickest! One of the best ways to stick to a goal is to arrange a private class for a group of friends or colleagues. You all get to meet up and learn something new together. Corporate classes are some of my favourite classes to teach. All you need is a group of colleagues and a spare meeting room. 8. Get your significant other on board with your training goals. Discuss your training commitments with your other half, especially when getting out means they have to be in to watch kids or pets. It might not seem important now but when motivation starts to flag, having a team on your side is the difference between pushing on or giving up. 9. You understand the concept of periodizing your training. Most people get bored because their training plateaus. Plodding through the same workout or running at the same intensity is better than nothing but your body quickly adapts to the same volume of exercise. A periodized programme means you constantly progress, keeping both your brain and your body interested and challenged. 10. Consistency is far more important to fitness and strength gains than intensity. There's a time and place for intensity but pushing yourself until you want to vomit in a bootcamp once a month won't serve your body or your bank balance. Twenty minutes five times a week beats one hour, once a week. How about you? 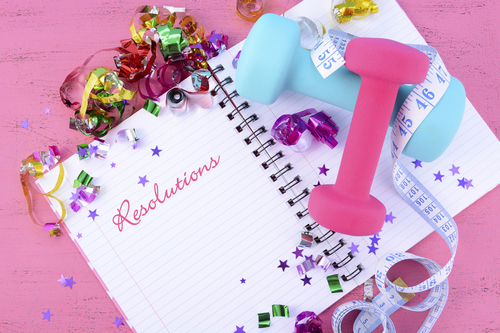 Do you have any top tips to help stick to a New Years Resolution? And do let me know if we can help at Farnham Pilates. We have a wide range of classes available for all abilities and needs – take a look here.